Members of the GSL Prom Committee have worked hard to plan and prepare an enjoyable prom. 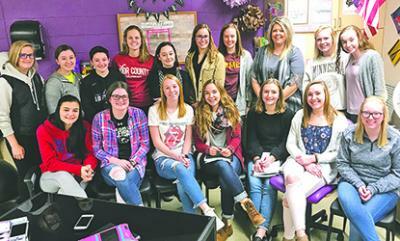 The group includes (back row, from left) Taylor Kaczmarek, Kalie Butcher, Maddie Emery, Morgan Verdeck, Gia Venier, Claire Witte, Mia Laplant, advisor Krysten Dane, Lily Schmitt, Hannah Boesche, (front row, from left) Tess Chap, Courtney Richer, Holly Bandemer, Grace Garoutte, Sydney Lepel, Kait Popp, and Abby Gronlund. Prom is Saturday, April 13. The grand march begins at 4 p.m. An evening of dinner and dancing will be after grand march at Glencoe City Center. Post prom festivities will be back at school until 3 a.m.